50/50 Draw for Easter Cash - last chance! 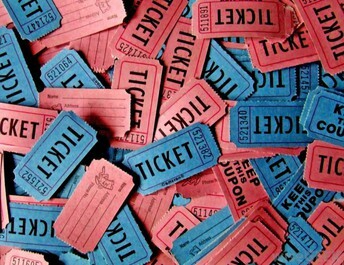 We are putting a big push on for the last week of ticket sales for the 50/50 draw for Easter Cash! The maximum Grand Prize could be a whopping $10,000! 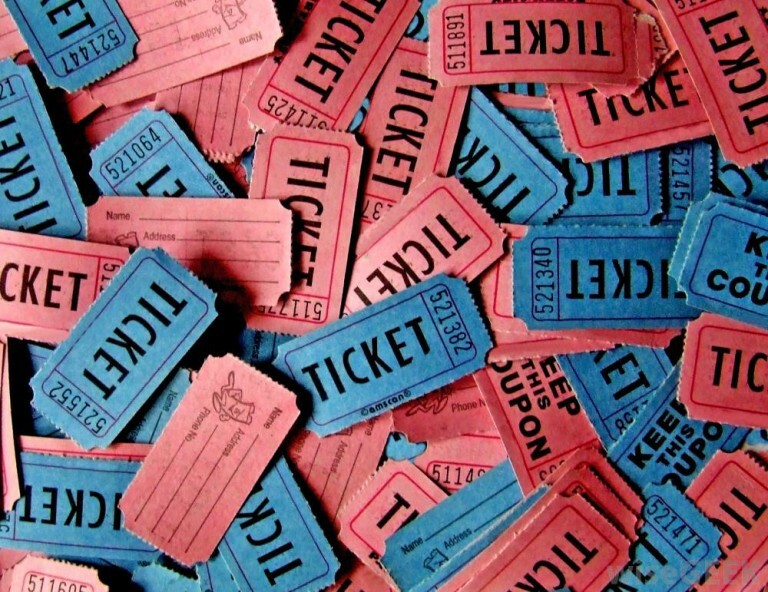 Tickets are $2 each, and the winner will be drawn on April 17, 2019. As an incentive for ticket sales, we are offering a top seller’s prize which will be a $200.00 gift card for Best Buy. Sellers also have a chance each week to win a prize for a local fast food restaurant. Finally, there will be ice cream treats for the top selling class. Each student will be given a booklet of 10 tickets. If you need extras, just let us know. 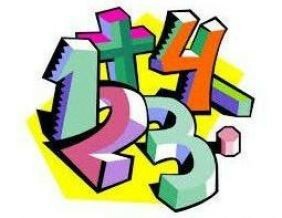 All proceeds will be used for new educational technology for our students. If you would like to make a monetary donation in lieu of selling tickets, that would be warmly welcomed. 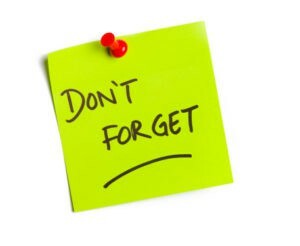 The ticket sale deadline is April 12, 2019, so please return any unsold tickets by then. We have reached a couple of milestones on our Children’s Wish Fundraising Campaign! As we have raised over $5000 toward our goal of $10 000, Mr. West has put his face and hair on the line. He graciously agreed to be pied in the face by Student Council President Daniel Blackmore in front of the MDJH student body. 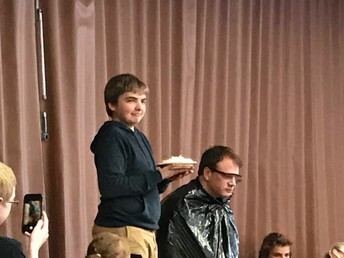 The weapon of choice was Lemon Meringue. 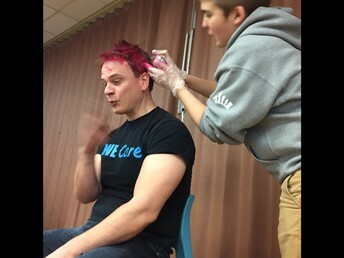 In the next week, Mr. West agreed to have his hair dyed pink. Keep an eye out for more milestones, as your donations help bring us closer to our goal of making a child’s wish come true. We are half-way there! 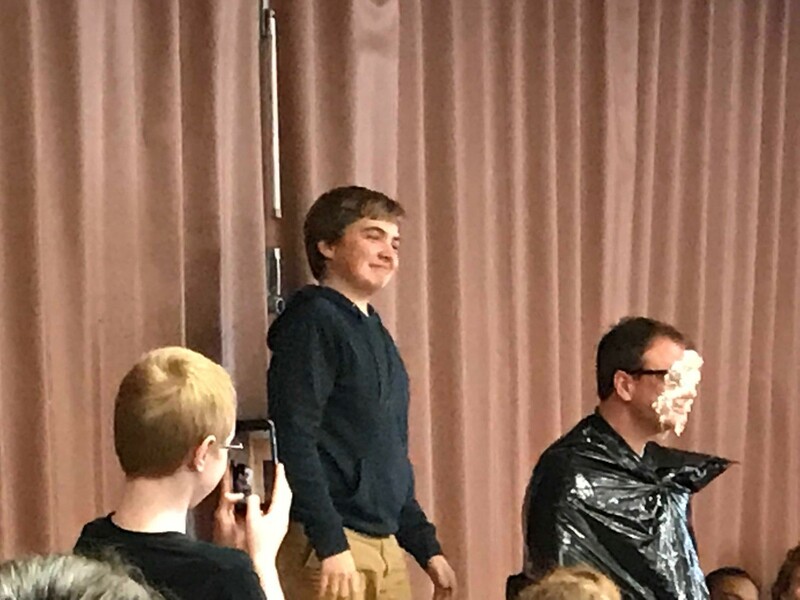 Another $5000 and we will be able to grant a wish by June! 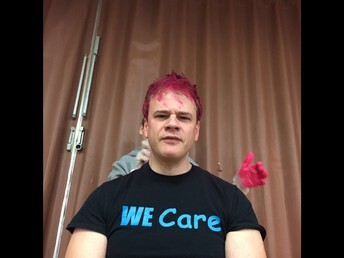 Mr. West models a colour not found in nature! 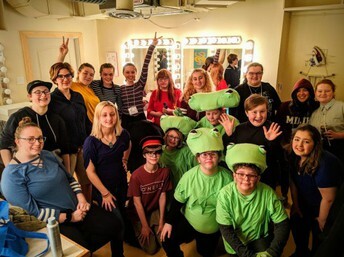 On March 30 and 31, the MDJH Drama Club performed a one-act play called “The Secret Life of Toads” at the LSPU Hall as part of the High School Drama Festival. 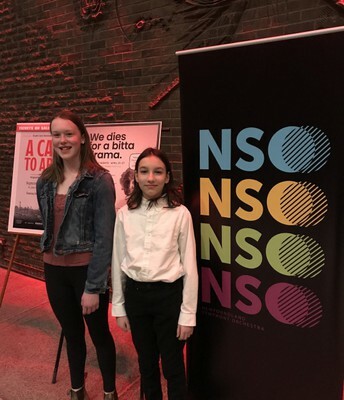 Eighteen of our students participated in a full day of workshops, and had the opportunity to view the performances of 10 other schools. The students received a special recognition for their ensemble work, another for costumes, and Best Actor (Junior) was awarded to Grade 7 student Sydney C. Congratulations to all the students involved, and to Ms. D. Mills, Mr. Flynn, Mr. Wade Gillard, and Ms. Penney for the Toad Heads. On March 20, students in 9-9 and 9-8 had presentations from the MUN School of Pharmacy about prescription drug abuse. 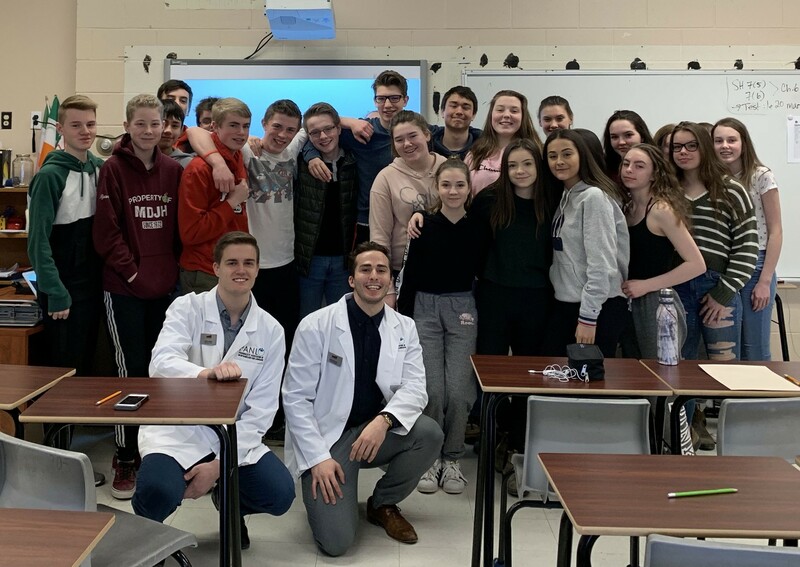 They also learned about MUN's Pharmacy Program. On April 1, MDJH students participated in the Be Cool for Autism Day by wearing their sunglasses in school. Just some sunglasses and a positive attitude...after all, it’s cool to be accepting of everyone! 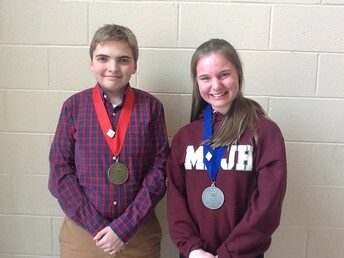 MDJH had students participating in the Skills Canada competition at the College of the North Atlantic this month. Silvi Ivardi received Silver in Photography and Daniel Blackmore received Gold for “The Pitch”. How Do You Jazz Up a Romeo and Juliet Review? You play Family Feud, of course! Today, students in 9-8 were lined up facing each other. One side was designated as the Capulet team and the other side represented the Montagues. Students came to the front of the class, two at a time, to ring the buzzer. They could enlist the help of their teammates if they were unsure of an answer. All students had a turn at the buzzer. 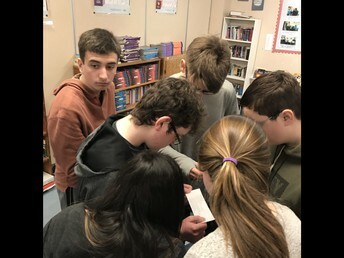 By the end of the competition, there was an opportunity to earn ten marks based on success in a group activity: arranging plot points in order. 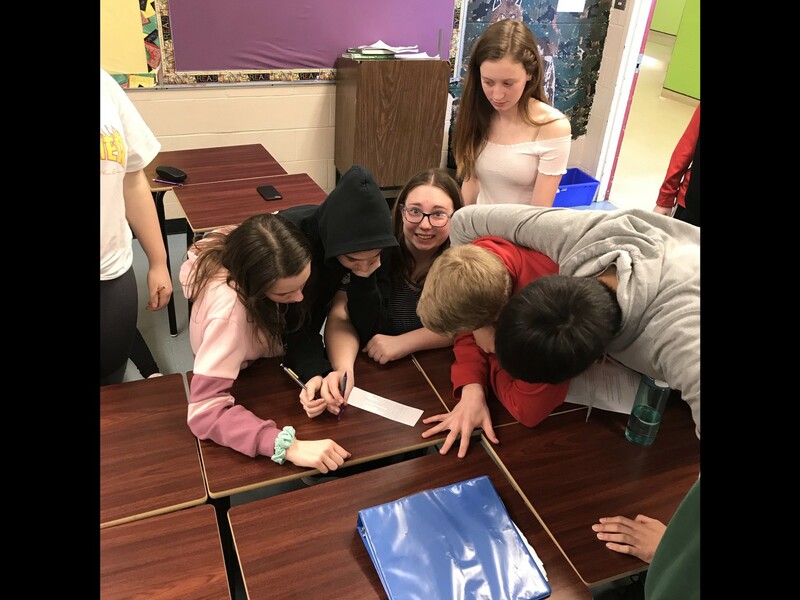 The Capulets “creamed” the Montagues, but all students had a good opportunity to review for their upcoming quiz. The best part - no blood was shed in this feud! Our school science fair on March 14 was a great success. 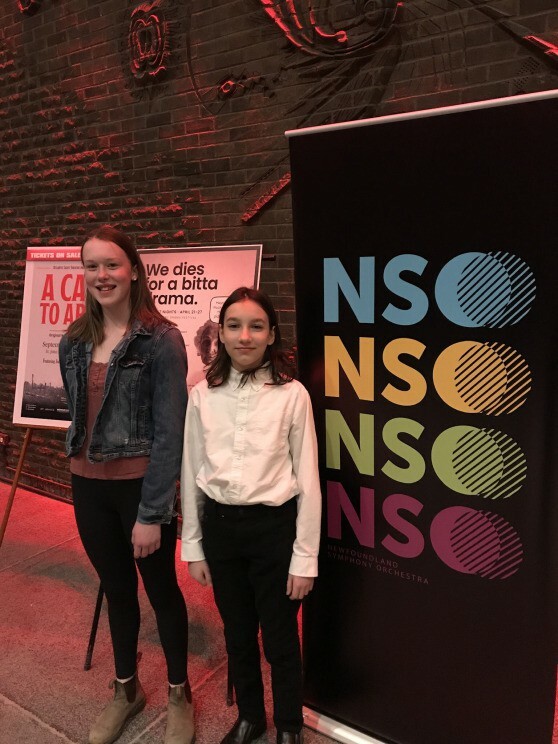 It showcased mostly Grade 7 students, with the addition of a few determined scientists in Grades 8 and 9. In all, we had 109 projects registered, with thirteen judges drawn from the St. John’s scientific community. Judges were very impressed with the overall quality of the projects and enjoyed the experience of talking with our students. The Science Department teachers are proud of all our students who participated and we are excited to announce the top projects of the MDJH Science Fair 2019. 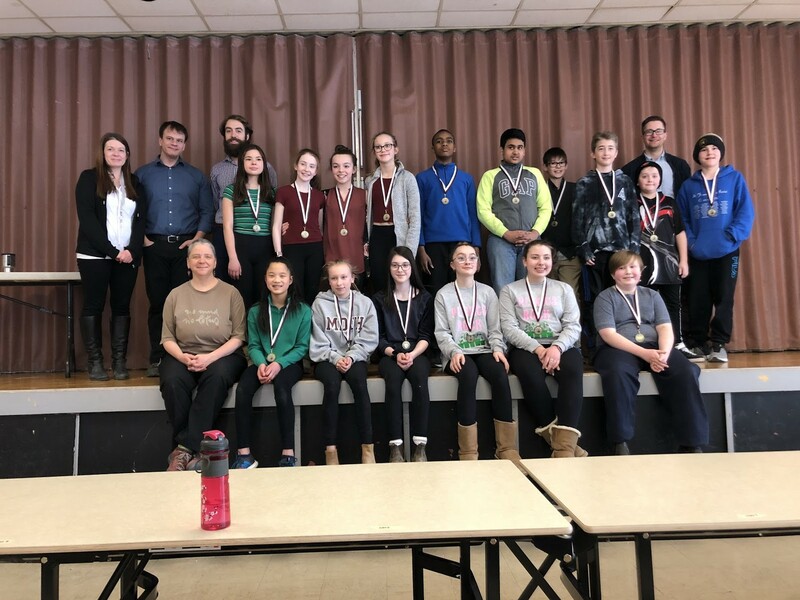 These students will represent our school at the Regional Science Fair at the Regional Husky Energy Science and Technology Fair on April 12-13, at Holy Heart of Mary High School. Ms. Riggs will accompany them. 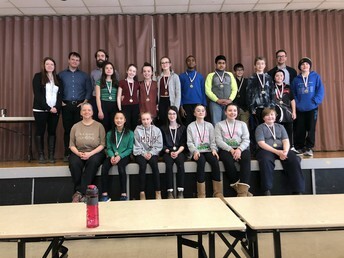 For students in Grades 8 and 9, the science fair project was not a course requirement. The intrepid souls who took on the extra challenge will also have the opportunity to present it at the regional Science and Technology Fair. One of the highlights of the Grade 9 School Leaving Carnival is the baby picture slideshow. 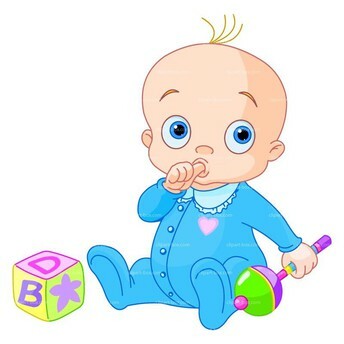 Any Grade 9 student who wants to be included in this slideshow must send their baby picture to Ms. Quann. 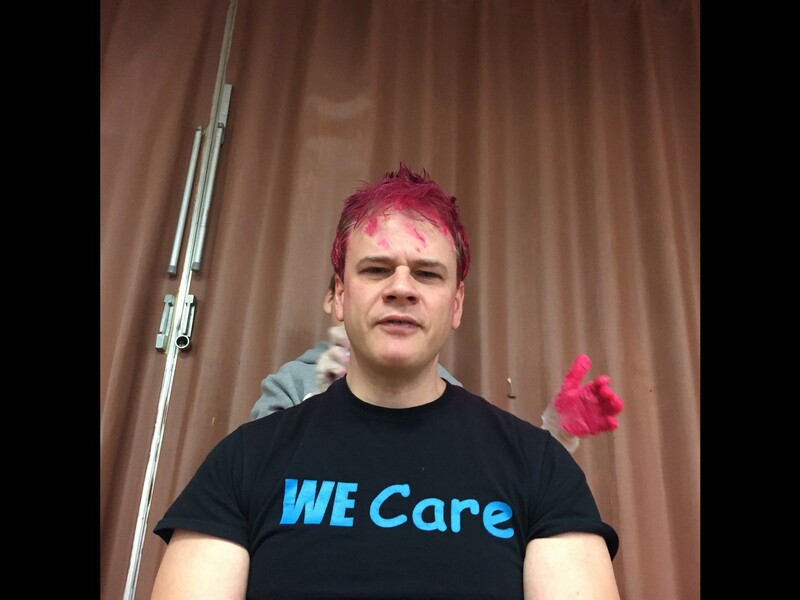 Please email ONE picture only to colettequann@nlesd.ca or you can drop it off at the school. 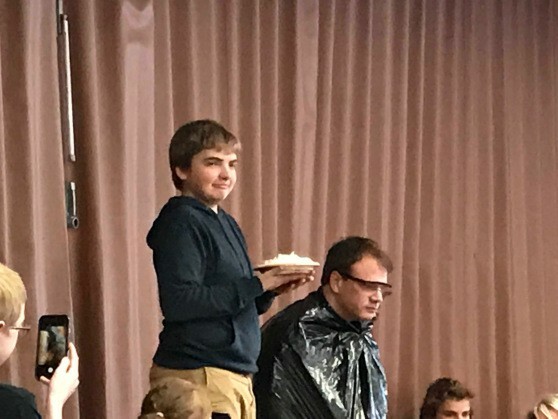 If you are going to drop off a copy, be sure to put it in an envelope and include the student name and homeroom on the envelope so we can return your photo. 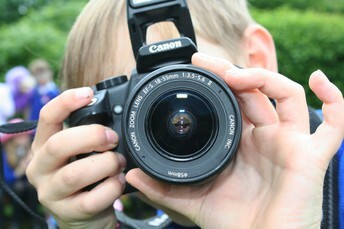 The deadline for submission of photos is Friday, May 10. 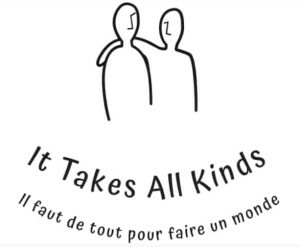 Announcement: It Takes All Kinds! 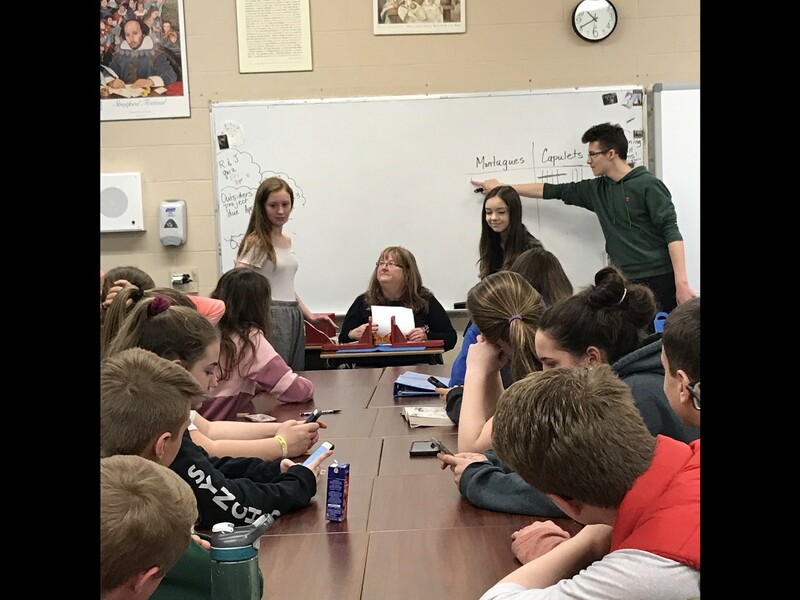 Macdonald Drive Junior High School is proud to host a Gender and Sexuality Alliance (GSA) Conference for LGBTQ+ students and their friends from Grades K to 12. Age-appropriate programming for all will be offered within the times indicated. Student groups should be accompanied by a teacher sponsor from their school. Parents/guardians of younger students are asked to accompany their child. Registration is now open at the following link (please note that you will need to be signed in to your @nlesd.ca email account in order to register). All participants, adults as well as students, are asked to register individually and indicate the name and email of their teacher sponsor. An accompanying parent/guardian can take the place of a teacher sponsor. 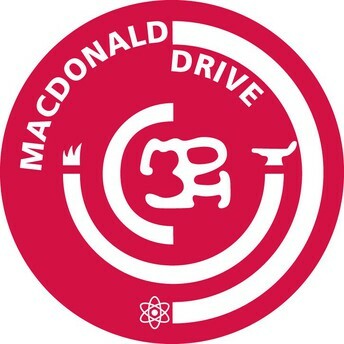 We ask that registration fees be collected by the teacher sponsor and brought to the Registration Desk on the day of the conference in the form of a cheque made payable to Macdonald Drive Junior High. 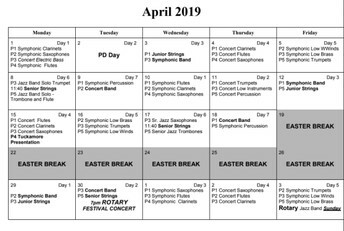 For additional information, please contact Mme Brunet in room 124 at MDJH, or by email at nathaliebrunet@nlesd.ca. 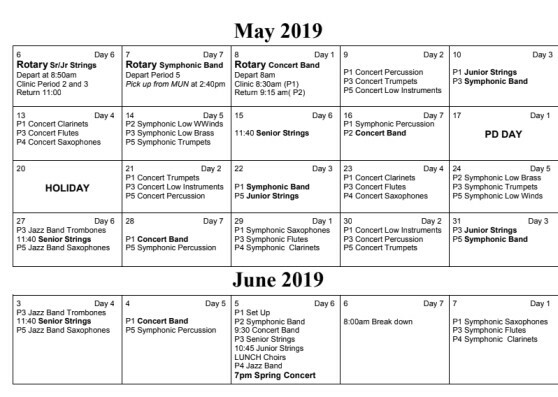 Registration closes April 12, 2019. Thanks to the Kids Eat Smart Volunteers! Thank you to our Kids Eat Smart Club Volunteers! 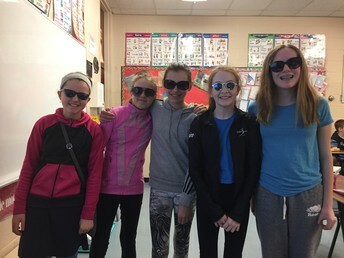 On April 8-14, 2019, we will celebrate Volunteer Week and we want to say thank you to our entire school community, parents, student volunteers and anyone who gives of their time at our KES Clubs. We would not be able to operate without your dedicated support, and we are proud to share with you, that you are part of over 6200 volunteers who help KES Clubs every school day. So for everything you do, thank you! Together we are making a difference. Congratulations to the Grade 7 Girls Volleyball team, who won bronze this month at the Provincials in Clarenville. 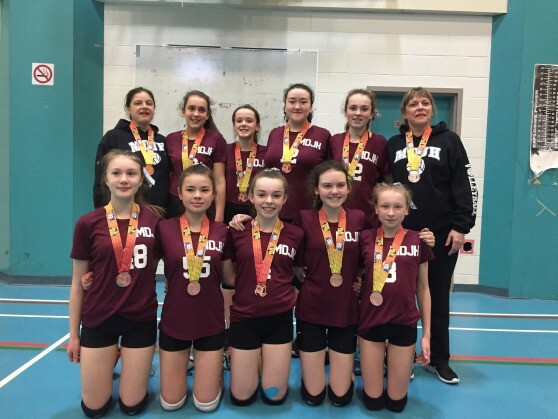 Congratulations to the Grade 7 Girls Basketball Team, who took silver at the Grade 7A Provincial Basketball Tournament! 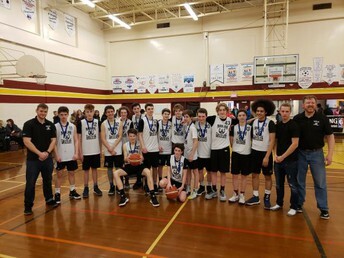 Congratulations to the Grade 9 Boys Basketball team, who took silver in the Grade 9A Basketball Provincials this month! 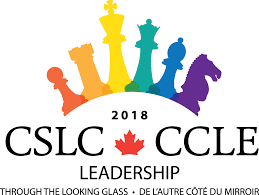 The next Canadian Student Leadership Conference will be September 24 - September 29, 2019 in Abbotsford, British Columbia. The theme is Empowering Inner Resources. The conference theme will flow through the keynote speeches, leadership workshops, volunteer opportunities, and cultural experiences of the conference. Any current Grade 8 student interested in attending this conference next year should see Ms. Quann. Parents can email colettequann@nlesd.ca to express a desire to have their child attend this conference. There may be room for one or two more students so please email ASAP before these spaces fill up. You can visit the website https://cslc2019.studentleadership.ca/ for more details. You can now order the 2018-2019 yearbook.The cost is $20. 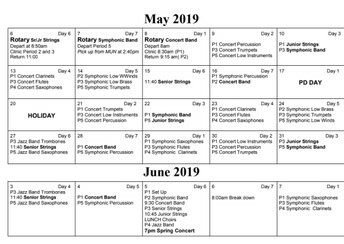 Forms are available at the office and from Ms. Quann colettequann@nlesd.ca. All students and events are included in the yearbook. It is not a yearbook for Grade 9 students only. 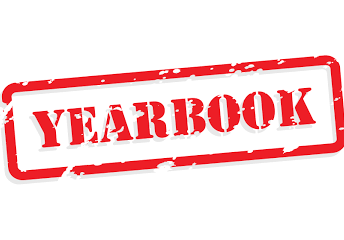 Yearbooks will arrive in September 2019. They will be available at school and also delivered to Holy Heart and Gonzaga for distribution. 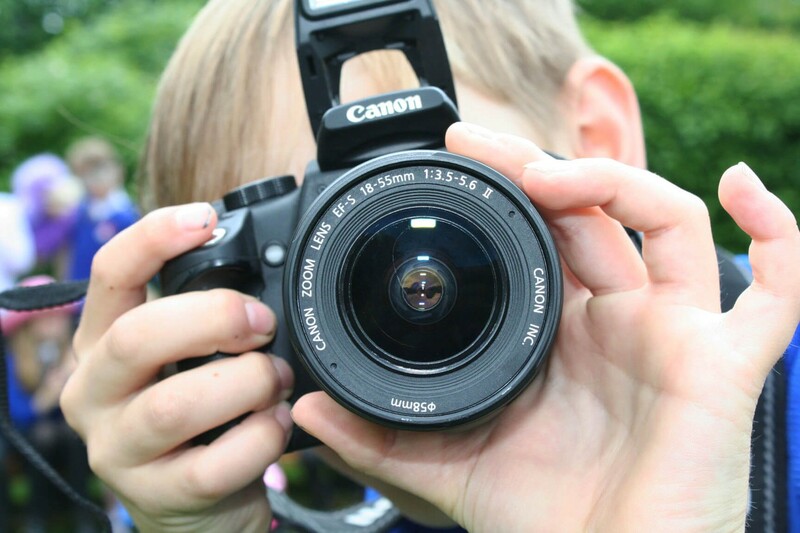 Thank you to everyone who has submitted pictures for the yearbook. 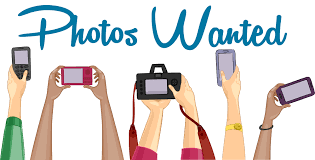 Please send any team pictures to colettequann@nlesd.ca. If sending from a cell phone, please select actual size to ensure the quality is good for uploading to the yearbook. We want to acknowledge and celebrate the accomplishments of the students of MDJH. We have a Wall of Celebration where we will place a certificate of acknowledgement highlighting participation and success in a variety of activities. 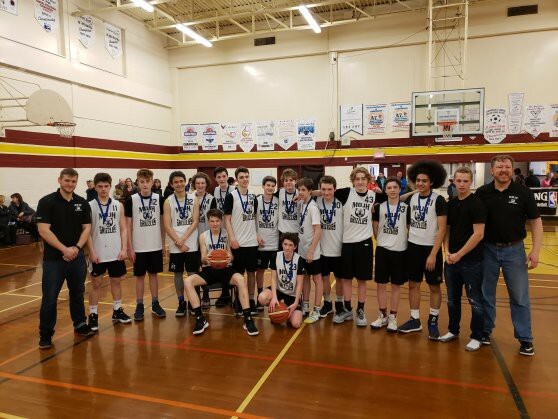 We want to know if your child has participated in any plays, musicals, has been on a team that has won some title, or has been recognized in any individual competition. We need your help with this. Please let us know so we can proudly display this on our wall. Please email colettequann@nlesd.ca with Celebrate YOUR CHILD’S NAME in the subject line. Pour pancake mix onto a heated grill into an egg shape. After it is cooked, cut it in half in a zig zag pattern. Place the bottom half on a plate. Make some scrambled eggs and place on top of the pancake for the chick’s head. Place the top of the pancake egg on the plate. Use 2 chocolate chips for the eyes and a small piece of an orange for the nose. 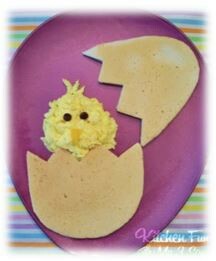 Recipe & Image Adapted from: https://kitchenfunwithmy3sons.com/peeping-pancake-breakfast. Using your favourite pancake recipe, cook your pancakes in mini portions. The pancakes can be made fresh or prepared the day before and refrigerated in an airtight container. Using the cookie cutter, cut flower shapes in the fruit slices. Cut a small hole in the center of the flowers if you choose to insert a blueberry. Stack the mini pancakes, 4 to 5 high. 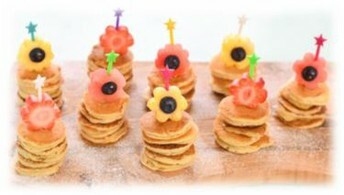 Push a fruit flower onto the plastic skewer, then push into a stack of pancakes to hold it all together, with the flower on top. Repeat for the remaining pancakes. 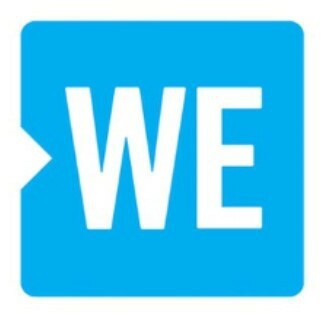 We are a WE School. Our background picture is by Silvi Ivardi.